Julie & Julia is a lovely film about the joys of cooking, affection, inspiration, and good ol' fandom. 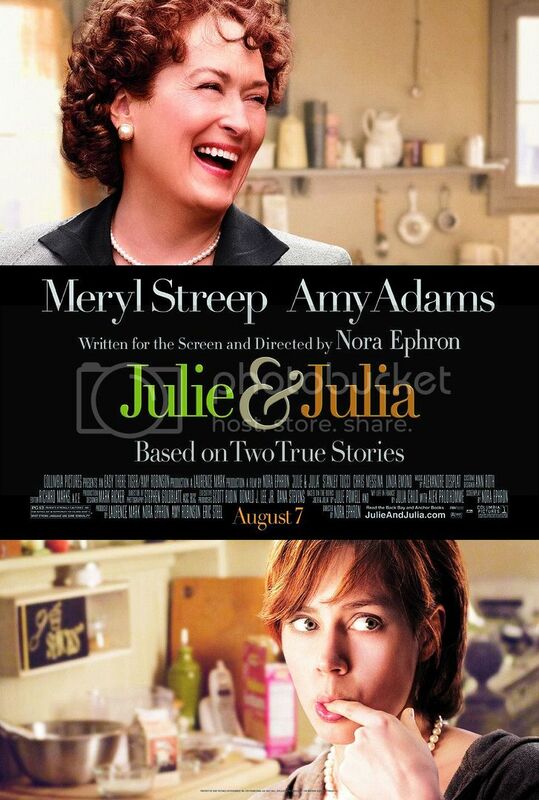 It follows the parallel lives of celebrity cookbook author Julia Child (a wonderful Meryl Streep) and her superfan/descendant, modern-day blogger Julie Powell (also wonderful Amy Adams). It is sweet without being saccharine, punchy and pleasant. Really, a joy of a film. We found ourselves mostly smiling and laughing, not because there were jokes, per se, but because it just made us so damn happy. Briefly, the plot tracks the two womens' lives such that each high, each low, is a mirror reflection: from Julia in the 1940s to Julie in 2002. For both women, the story starts with their fresh move to a new, strange place - Paris and Queens. Both women are at a loss, with fizzling careers and anxious to do something new. And, for both women, that inspiration becomes cooking: with Julia pursuing a degree at Le Cordon Bleu, and - reflecting forward - Julie deciding to blog her way through cooking all of Julia Child's 524 recipes from Mastering the Art of French Cooking. The narrative arc is a slow rise, with little conflict. Sure, we get some historical moments - such as Julia's husband, Paul Child (Stanley Tucci, always lovely), getting a bit harassed by McCarthy-era bullying - but it's nothing heavy. Everything is as light and airy as a hollandaise sauce, where butter "dies and goes to heaven". The performances are all strong, with the older couple - Meryl Streep and Stanley Tucci - perhaps outshining their younger counterparts. This is partly the fault of the screenplay; Julie comes across as a bit less likable, and more narcissistic, than the zany, towering Julia. Amy Adams - who can be just as adorable as Meryl Streep (and Meryl is pretty goddamn adorable in this film; her clucking and hamming it up made us LOL and wish she was our friend!) - does what she can, but she sort of comes across as, at best, a semi-precious Meg Ryan from You've Got Mail. We hate to have to bring this up, but we do just because it's so rare: here is a film by a woman (the late, great Nora Ephron), about women, which is fun, funny, smart and eminently freeing. Why does that have to be so rare? We wish there were many, many more films like this. Films that didn't need to be labelled "chick flicks" (vomit), films that can show us fresh, new stories. Julia Child had a really interesting life! Dammit. Also, Amy Adams is great. And Meryl Streep is our jam these days. Can this woman be more lovable? We think the answer is no. Here are some GIFs and some YouTubes and TA DAAAA.